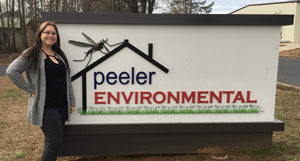 Suzan Eudy, office manager of Peeler Environmental, Salisbury, N.C., has been awarded the inaugural Administrative Professional of the Year Award by the North Carolina Chapter of the Professional Women in Pest Management (NCPWIPM), a committee of the North Carolina Pest Management Association (NCPMA). “We are proud to honor Suzan Eudy’s work with our first Administrative Professional of the Year Award. Her work at Peeler Environmental has earned the respect of her colleagues and has now earned the recognition of our association,” says Bruce Roberts, president of NCPMA. Eudy has worked at Peeler Environmental in Salisbury for five years. NCPWIPM began awarding the Administrative Professional of the Year Award annually in 2018 to the administrative professional who best demonstrates customer service both internally and externally and a commitment to the company’s purpose. Each nominee must be a current, full-time administrative support staff member and must have worked in his or her current position for at least two years. Eudy was recognized at the 2019 Pest Control Technician’s School held at the Sheraton Imperial Hotel and Convention Center in Durham, NC. She received a plaque, a $250 gift card and a one-night stay at the 2019 PCT School and a gift card to cover expenses for the trip. Founded in 1952, the North Carolina Pest Management Association (NCPMA) is the trade association representing the professional pest management industry in North Carolina. NCPMA promotes the continued cooperation and success of all pest management businesses in North Carolina. NCPMA is the only statewide association dedicated to representing and educating North Carolina’s pest management professionals.